I stitched these for my kids for Christmas this year. Unfortunately, I was a little late with getting them finished. I think they really turned out cute though. They are all 3 from a couple of the Lizzie Kate Tiny Tidings packets. Thanks for looking and have a wonderful New Year. After many years I have finally finished these ornaments and have given them to my family members for Christmas. 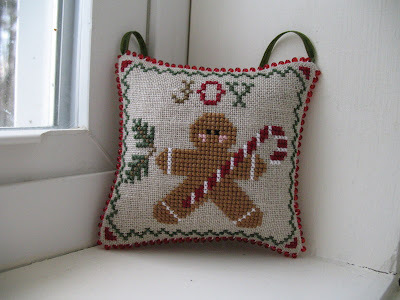 I want to stitch some of these again for me, especially the cat (though the cow is cute, too). 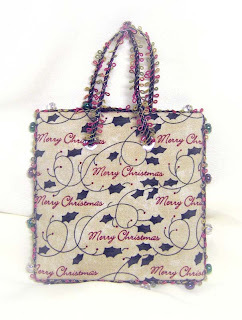 Labels: Barbara Ana Designs, Blackbird Designs, JCS 2008, Laurie W.
I stitched 2 of this ornament, one for me and one as a gift. 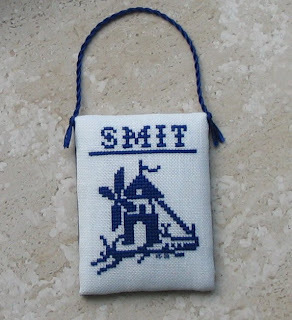 It is an old freebie from Cross Eyed Cricket, and is stitched on 14 count vinyl weave with DMC floss. I finished it by gluing felt on the back. Merry Christmas....thanks to everyone for all the beautiful ornaments which provided me with unlimited inspiration and which kept me motivated through the entire year. It has been a lot of fun. I managed to make most of what I set out to make. I still have one photo left to post from 2008 but the recipient must first receive it ! Cozy Christmas Wishes by Lizzie Kate which I modified a bit, changing some colors and adding my sister's name to the mug... The original Freebie chart can be found here. These are the 12 Texas Montly Minis by Redbird Designs, done on 28 count evenweave with mostly DMC floss. They were a gift to #1 son-in-law who is from Texas. Charlescraft stockings purchased in Connecticut this summer and lettering borrowed from a book called "Heavenly Cross-Stitch" by Marie Barber. 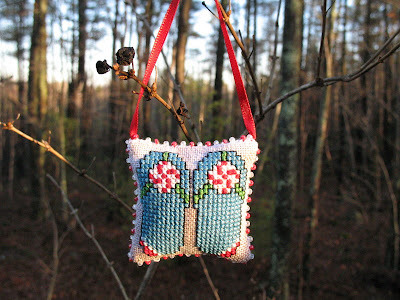 These little cuties are headed belatedly to friends in Norway. Looks like Carol and I had the same idea. 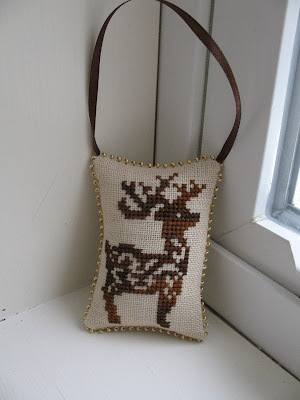 I too stitched Renne de Noel. The glue is visible as I wanted to share tonight as tomorrow will be a busy one for me. 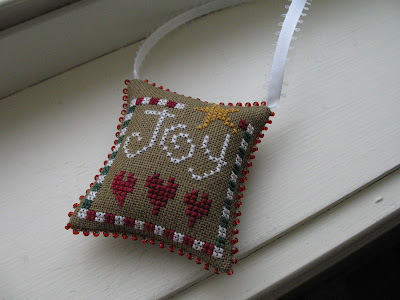 Although I finished the cross stitching for 5 more ornaments, I haven't got them finished into ornaments in time for this Christmas. I'm going to try to discipline myself to work on them over the next few weeks so that I know that they'll be done for 2009! These are the 2 ornaments I finished last week. The Noel I stitched for myself and the second was stiched for a co-worker/friend's new baby. 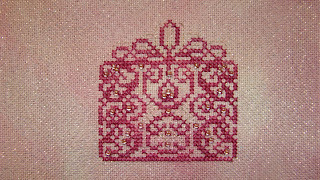 The ornaments themselves may be stitched but the finishing will be completed hopefully today or tomorrow. 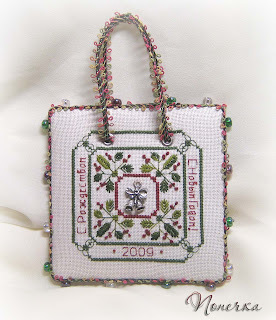 The first one is from The Prairie Schooler and the second is a Christmas Box Ornament by Country Garden Stitchery. The latter was done on a Silkweaver Opalescent Solo using Dinky Dyes Shiraz silk floss. I love these little ornaments. There are three in the series and I plan on doing the other two in the new year. Merry Christmas everyone! I had hoped that I would have more Christmas ornaments under my belt by this time this year, but things just never work out like you plan do they? Oh well, here is the cute "A Merry Kitty Klaus" by Val's Stuff out of the 2007 JCS Ornament issue. Since I stitched it on Rue Green linen, I changed the background color around the kitty from green to pale yellow. I also didn't have any Whisper thread, so the brim of the Santa hat is just good old DMC blanc. I haven't finished it into an ornament yet... maybe tomorrow. 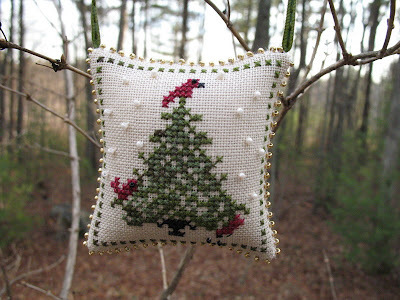 I'm so in the mood to stitch and finish ornaments so that is all I've been working on lately. Here are my two latest results (front and back views). 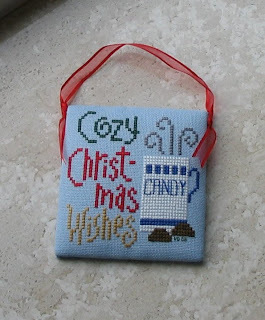 Here is my last ornament for 2008. 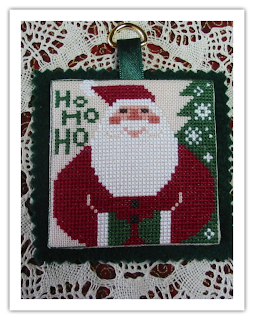 The design is by Prairie Schooler from the December 2008 Gift of Stitching magazine. 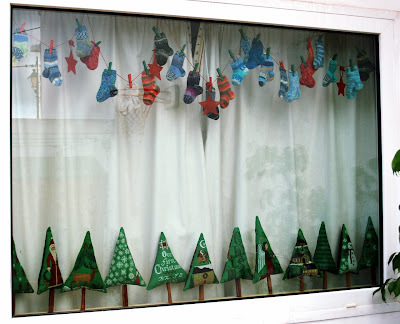 Now to get organised for next years ornament stitching. Happy Christmas to you all. Sue in Australia. 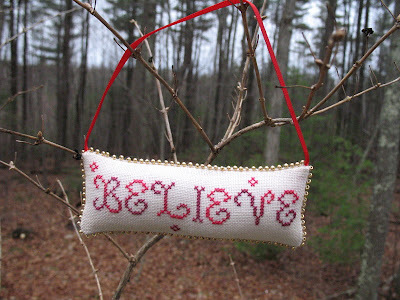 This is an entirely beaded ornament. There is a net of crystals and seed beads surrounding a central crystal cabochon (flat round crystal). 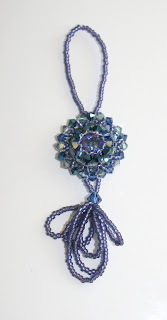 The pattern was adapted from a necklace pattern in Bead & Button magazine. Merry Christmas to all of you and a Happy New Year!